Routes are the different ways by which the particular products are obtained or sold from the warehouse. Routes might be relevant or not appropriate relying upon the products, the sales order lines, the stockroom, and so on. To satisfy a procurement, the system will scan for rules belonging to routes characterized in particular sale order. A procurement is nothing, but a demand for a particular amount of item to a particular area/location. One in this manner needs to include vital push and procurement rules for making a route. 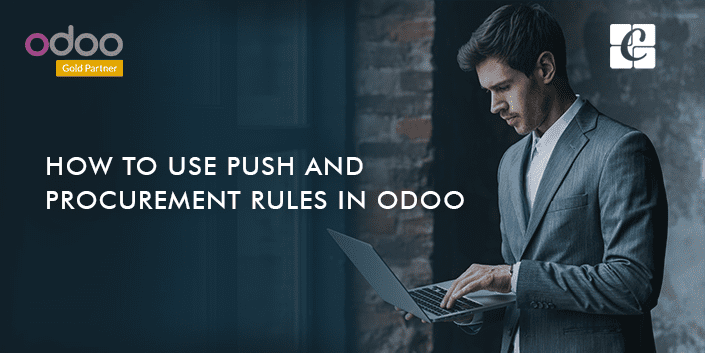 Odoo ERP comes with advanced push/pull routes configuration for easy product management. Let us see in detail. Procurement is the action of obtaining the desired or required amount of product rather than going for bulk, and the procurement inventory control system begins with a customer order. One of the prime advantages the end user can acquire from the procurement rule is that he can evade the possibility of excess inventory. Here, the end user is freed from the management or storing of excess stock. The procurement rule reduces the inventory levels and thereby the cost of storing the goods in the inventory. Push rules move the given product quantities from the source location to the destination location. 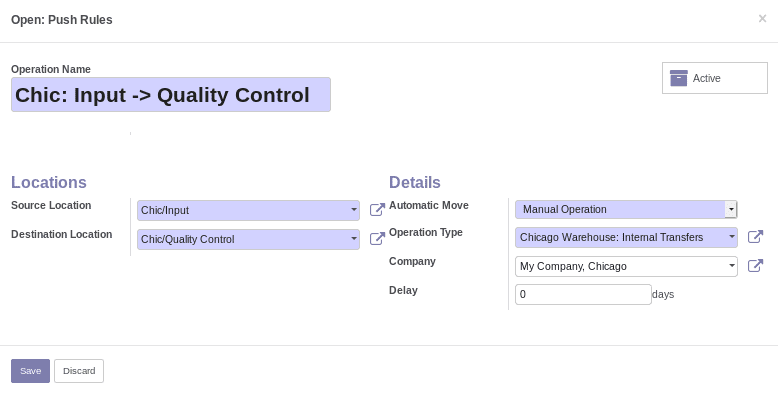 Under Odoo ERP, one can set these moves both automatic and manual. When a move is foreseen to a location, the push rule will automatically create a move towards the next location. 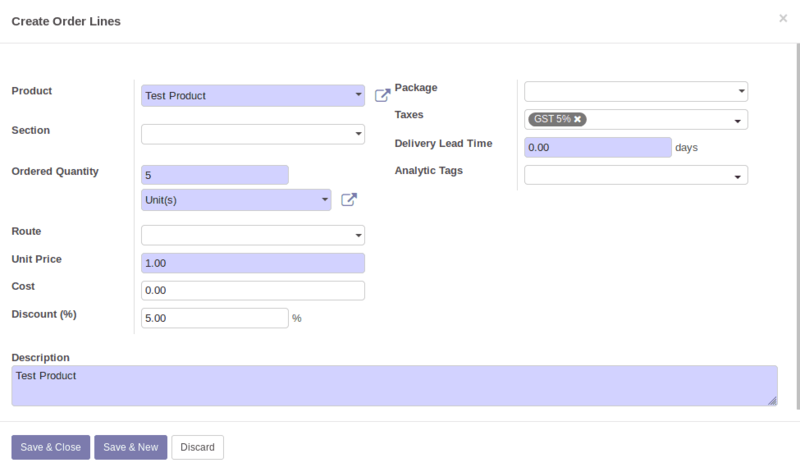 The default routes in Odoo ERP includes: Drop Shipping, Buy and Make To Order. Drop Shipping: Under the Drop Shipping function, the vendor does not keep the products in stock, rather process the delivering of goods directly from the vendor to the customer. There will not be any stock housing during the transit. Buy: Buy proposes a purchase or manufacturing the product. Make To Order: The Make to Order function trigger a purchase order as soon as a sales order related to the product is generated. Here, the function doesn’t evaluate the current stock and draft a purchase order even if the product quantity is inadequate. ie. it triggers the purchase order regardless of the product quantity in hand. One can see the routes for each product under the inventory tab of the product. The checkbox is checked under the route view’s applicable on the section. One has to specify the route name under the route name input field and also have to select the places -which the created route is applicable for. Tick product to view the rule in product, tick product categories to view the rule in the product category and also tick warehouse and sales order lines to view the route in corresponding paths. How to create Push Rules? Push rules trigger when items enter a particular area. They automatically move the item to another area/location. One can find the following fields here. 1) Operation name: This field contains the name of the push rule which is created. 2) Source Location: Is the location in which the rule can be applied when a move is confirmed. 3) Destination Location: Is the new location where the goods need to go. 4) Automatic: This field is related to the stock moves, in the case of ‘Manual Operation’ it will create a stock moves after the current one and in the case of ‘Automatic No Step Added’, the location is replaced with the original move. 5) Operation Type: In this field, one can specify the operation type that will be put on the stock moves. 6) Delay: Under the field, you can specify the delay needed to transfer the goods. Here the end user has to set the source location as ‘Chic/Input’ and destination location as ‘Chic/Quality Control’ because you are planning to transfer the goods from input location to the quality control location of the Chicago warehouse. The operation type is ‘Chicago Warehouse: Internal Transfers’ because you are transferring the good internally in Chicago warehouse. 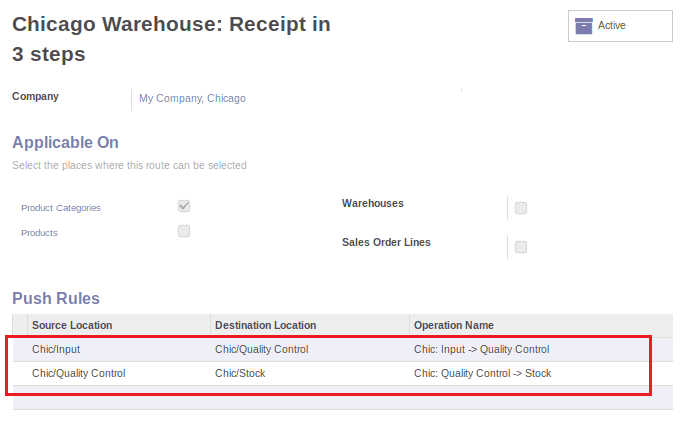 Here the source location is ‘Chic/Quality control’ and the destination has to be set to ‘Chic/Stock’ and the operation type is ‘Chicago Warehouse: Internal Transfers’. Here when the stock comes to the quality control location of the warehouse, the corresponding stock will be pushed to the stock location of the Chicago warehouse. This way the end user can create push rules. Procurement is a request for a specific quantity of products to a specific location. Procurement is automatically triggered by other documents: Sale orders, Minimum Stock Rules, and Procurement rules. One can also create new procurement rules for a route from the following path. a) Move from another location rules. b) Manufacturing rules that trigger the creation of manufacturing orders. c) Buy rules that will trigger the purchase order. 2) Procurement: Procurement location is a location in which the procurement is created. 3) Company: One can specify the company applied to the procurement rule. 4) Source Location: Source location is the destination from where the goods are moved. 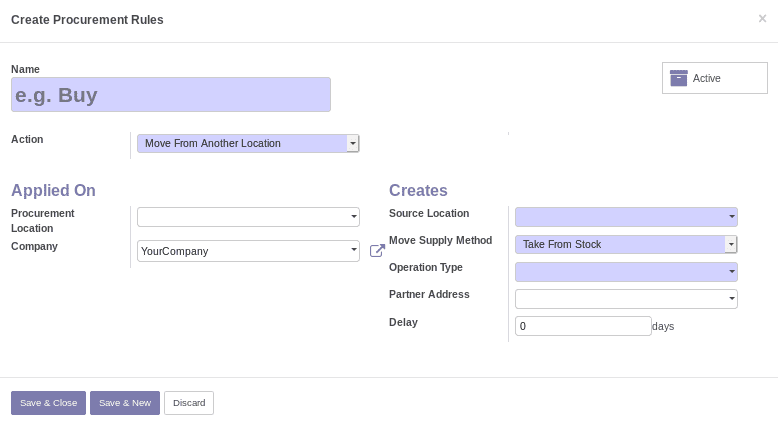 5) Move Supply Method: The Move Supply Method field determines the procurement method of the stock move that will be generated, in the case of ‘Take From Stock’ it will take from the available stock in the source location but in the case of Create Procurement it will ignore the stock and create a procurement. 6) Operation type: Operation type field defines the way in which the pickings are shown in the reports or the views. Also, the end user can provide the partner address and the delay from the above view. The routes you have created by applying appropriate procurement and push rules will be displayed under the inventory tab of product view. You are attempting to sell the product from a different warehouse say ‘Bangalore’ warehouse (WHB/Stock), then a warning message will be shown. 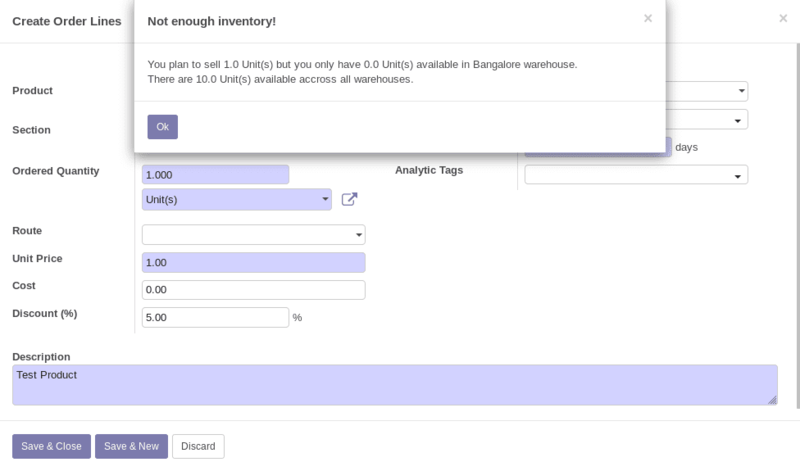 You plan to sell 1.0 Unit(s), but you have only 0.0 Unit(s) available in Bangalore warehouse. In order to overcome this problem you have to create a route, here a route named ‘Pune ->Bangalore’ is created with procurement rules as shown below. Here, the end user has to use a transit location in order to do the inter-warehouse transfer. Transit location is a counterpart location that should be used in inter-companies or inter-warehouse operations. Here, the first procurement rule is used for transferring the product from ‘Pune’ warehouse to ‘Virtual Locations/InterCompany Transit’. 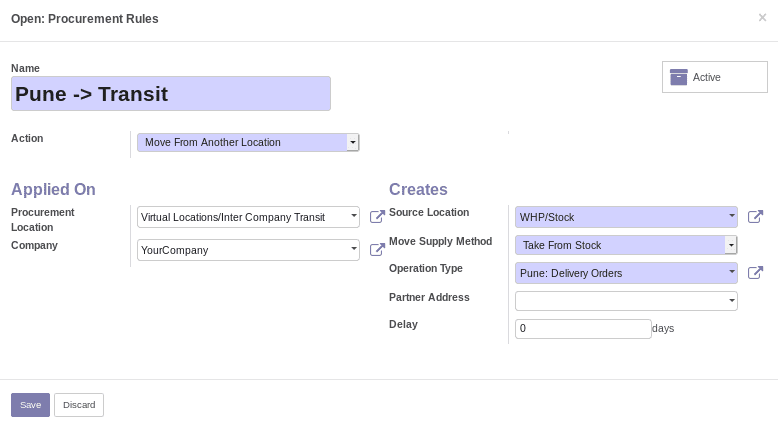 For that, one needs to set the procurement location as ‘Virtual Locations/InterCompany Transit’ and the source location as ‘WHP/Stock’ and also the Move Supply Method has to be set to ‘Take From Stock’. The action field of this rule has to be set to ‘Move From Another Location’ because you are moving the product from one warehouse to another. Here the operation type is ‘Pune: Delivery Orders’ because the product is transferring from Pune warehouse. The second procurement rule is used for transferring the product from ‘Virtual Locations/Intercompany Transit’ warehouse to ‘Bangalore’. For that you have to set the procurement location as ‘Bangalore’(WHB/Stock) and the source location as ‘Virtual Locations/Intercompany Transit’ and also setting Move Supply Method to ‘Create Procurement’. Here the operation type is ‘Bangalore: Receipts’ because the product is getting transferred to the Bangalore warehouse. 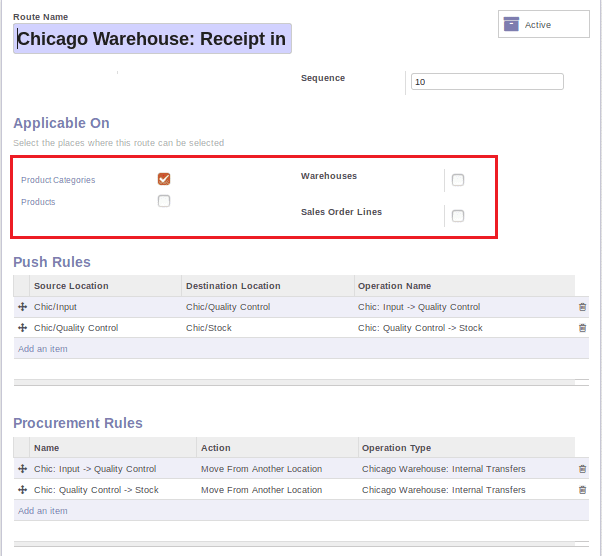 After creating the procurement rules and route, the end user has to select the route from the product’s inventory tab as shown below. You have to select the created route and also the Make To Order in order to perform the transfer. After that, when you select ‘Test Product’ for creating a sales order, there will not be any warning message displayed. You can see that there will be 3 delivery orders created when confirming the sales order. One has to validate each delivery, manually to complete the delivery process. Also one can see the stock moves given below. You can see that the product ‘Test Product’ is moved from WHP/Stock (which is Pune warehouse) to WHB/Stock (which is Banglore warehouse) through the Intercompany Transit location and also the product is finally delivered to the customer which is Partner Location/Customers. 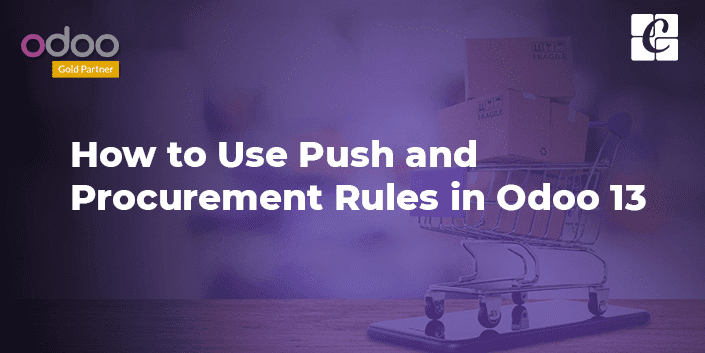 This how push and procurement rules work in Odoo ERP.